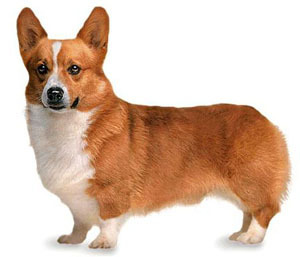 The Welsh Corgi, Pembroke came in to existent in wales, this breed of dogs is used for multiple purpose and are very famous for their working abilities. This dog breed was used for hunting, as a guardian and as a watchdog. They are also known as the favored pet of Queen Elizabeth. This breed of dogs is very energetic, athletic and brave which makes this breed a true champion. They possess lots of stamina and are very intelligent, they are known as a big dog in a small dog suit. The Welsh Corgi is loving, obedient and loyal. They are very friendly and have a very sweet and nice nature. This breed of dogs is alert and fearless; they are very strong and are suspicious of strangers. They have a tendency to form a strong bond with their master and family and can become destructive if they are left alone for long periods of time. This dog breed does well with children and other pets if they are properly socialized, because of their hunting instincts they run behind everything which moves. The Welsh Corgi is a double coated breed: the outer coat is medium in length, straight and coarse in texture, where as the undercoat is thick, short and weather resistant. The color of the coat comes in sable, fawn, red, and black and tan. There may or may not be white markings. This breed is heavy shedding, and does completely shed bi-annually. This breed of dogs requires consistent training, training should be given to them with fairness and patience they will not respond to hard and harsh methods of training. This energetic and full of stamina breed requires every day walk and enjoys to participate in running games or competitions. They do well in apartments if they are provided sufficient exercise. This breed of dog requires minimal grooming, they should be brushed regularly to avoid dead hair and dirt and bathing should be done when needed. It is the pet owners responsibility to keep your pet healthy, give it a healthy environment and always look out for symptoms of disease. If you notice signs and symptoms of any diseases be sure to consult with a vetrenary at the earliest for timely treatment.